"Andy has a presence like no other speaker I've heard. He has a way of relating with his audience on an intimate level - like we've all been friends for years! All the students loved hearing him speak on the topic at hand and his comic relief was really needed. Andy spoke to our group for more than an hour but it only felt like ten minutes! He goes between speaking and activities so that the audience feels like he's not talking at them, but rather having a conversation with them. He's great! That's all that I can say! We'll definitely invite him back again!" Natasha De Gouveia, Sponsorship and Conference Weekend Coordinator, Terry Fox Team (for Cancer Research Fundraising), Western University in London, Ontario. Andy’s presentations run approximately 45-90 minutes in length, based on your needs. He also offers skills-based leadership workshops that complement the messages of his keynotes. These presentations are based on his experiences as a former university student leader, as a speaker traveling North America, and as a successful entrepreneur in the field of leadership and personal development. Andy’s specific experiences at King’s University College at Western University (London, Canada) as a student, an Orientation Week leader (1990 & 1991), as the Orientation Week Coordinator (1992) and as a leadership consultant (1993 to present) give him excellent background for these sessions. Andy's Presentations are perfect for Orientation leaders' training, Orientation week entertainment, students' council/residence council training and motivation, residence staff programs, special faculty or residence evenings, awards banquets, student leadership retreats, "thank you" programs for campus volunteers, specific class presentations, leadership conferences and presentations open to the entire student body. ALL SESSIONS include a mix of cheers, icebreakers and games to keep the students laughing, motivated, meeting each other and participating! All sessions run 1 to 2 and a half hours, depending on the time you give me and the number of icebreakers you want me to include in the program. Keynote presentations offer motivation, thoughtful insight, and humorous reflections through Andy’s unique high-energy delivery. Keynotes are not "note-taking" sessions and have a higher "entertainment" element than a workshop. Get Your Hand UP: Ask Questions! Answer Questions! Try Your Best! Volunteer and get involved in school activities! Bring back your grade 2 “recess attitude” of “pick me, pick me” to take advantage of your time in college/university to learn and have fun! “I was there!” is the running theme throughout this hilarious and powerful talk. As a first year university student arriving at King’s at Western U on an academic scholarship, Andy was stunned by a 62% on his first essay. He also decided to take a “year off” from being involved after being student council president in high school. Drawing on these experiences, this presentation brings an atmosphere of trust, openness and fun when most needed by your students. Andy tells first years that it’s okay to feel a little out of place but that the feeling is only going to get better by taking action. He talks about the lessons he learned from doing poorly on my first assignment (and how I took that 62% to a 75%) and how he decided to get more involved in second year and beyond. Additional themes from the program include: do more and you get more, getting involved in activities outside class, the importance of attending class & doing homework, making this place “home”, and having the courage to let yourself learn and have fun! Western University in London, Ontario has had Andy deliver this program at least 8 times each orientation week since 1993! Wilfrid Laurier University in Waterloo has booked this program for all of their first year students every year since 2004. Wilfrid Laurier University in Brantford has booked it for their first year students the past 3 years in a row. Waterloo University has booked it 4 years in a row by putting over 4000 first year students in a gym to hear Andy inspire them! Queens University in Kingston booked this presentation for 11 years in a row for their Arts & Science students. "I would strongly recommend Andy's presentation to anyone who is looking to provide some motivation for their staff or organization. His use of humour and audience participation keeps students interested in his speech while he delivers an important message about caring. He tells personal stories that the audience can relate to. Most importantly, Andy presents in a style that suggests he wants to help us, instead of the "I am going to save the world and am going to tell you how you can too" approach that many of us have seen." This is a perfect session for orientation and residence staff training prior to orientation week. Drawing on Andy’s experiences of 3 years as an orientation week leader and over 22 years training these leaders, he powerfully reminds your staff of the fun, impact and responsibilities that their position carries. Additional themes from Andy’s leadership training include commitment, teamwork, motivation, and handling stress. 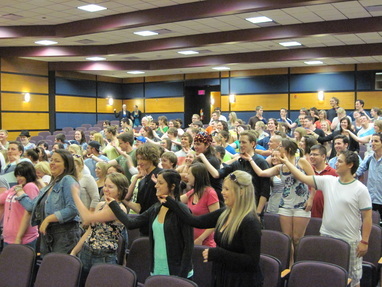 This fun and powerful session also includes icebreakers and cheers that your leaders can use during orientation week! This program can run from 45 minutes to 3 hours, depending on how many icebreakers and games and discussion time you want to add. This program is used by the Western University in London, Wilfrid Laurier in Waterloo, Wilfrid Laurier U in Brantford, The U of New Brunswick, The U of NB in Saint John, St. Thomas University in Fredericton, Cambrian College in Sudbury and the Shinerama/Cystic Fibrosis National Leadership conference EVERY year! 20 other universities and colleges have booked this training program, from Laurentian U in Sudbury to Fleming College in Peterborough, Brock U in St. Catharines to Mohawk College in Hamilton. "I did a survey of all the redshirts (our Orientation Week volunteers) at the end of the whole week. So many of them listed Andy as their favorite part! The UNB Orientation Program will always have Andy back to speak to our Orientation leaders. He embodies in his 2 hour speech everything that we are trying to get across to our volunteers and more. He is funny, articulate, intelligent, down to earth and approachable. Expect to leave his presentations with a new outlook; you'll never go back to being a wallflower!" Andy motivates his audience by reminding us that despite this great era of change, the keys to success haven't changed! Using his life story and insights of his friends across the continent, Andy points out that tomorrow's success starts with commitments made today. His 5 success keys are: Do more = get more, Share Your Care, don’t give up, Friends and family are everything, Set goals and focus on the future. The program can be adapted from a keynote of 45 minutes to a workshop lasting up to 4 hours. This session addresses the concepts of "time management" from a unique and very interesting perspective. Trust is the foundation for loving families, fun friendships, spirited students' councils, successful businesses, and effective leaders. Yet people earn the trust of another by being reliable. Andy offers useful and immediately applicable advice on improving your reliability. Through his insights, he demonstrates how improved time management will increase one's reliability!